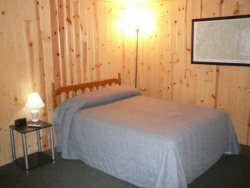 A relaxing retreat on the North Fork of the Flambeau River with access to Smith Lake. This property features comfortable living room and dining area, well-equipped kitchen, full bathroom, 2 bedrooms and loft (with a total of 5 beds). Extras include satellite television, deck, charcoal grill, picnic table, and pier. Located on the shores of the Flambeau River, you will see wildlife at its best with rest and relaxation around every corner!